Zane is an exciting winger who made four first-team appearances for Luton Town during the 2016/2017 season, all in the Checkatrade Trophy with starts against Gillingham and West Brom, then as a substitute against Millwall and Swindon. The move to Clarence Park in March 2017 was Zane?s third loan in non-league football, having spent time at Evo-Stik League Southern Premier side Biggleswade Town and our National League South neighbours Hemel Hempstead Town in the last two seasons. 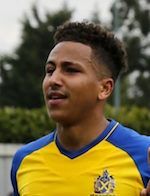 Zane was recalled by Luton prior to the Saints final game of the 2016/2017 season. He was then released by Luton at the end of their season. Zane then signed a permanent deal in June 2017 with the Saints for the 2017/2018 season.